Jewish holidays are always interesting in our house. Mainly because we’re not Jewish, but there are Jewish holidays in our house. This is a recent phenomenon for me. I was raised Catholic in a predominantly Catholic neighborhood. But even those traditions have been mostly abandoned in our home. Lilly is being raised mostly in the Pseudo-Christian/Selective-Buddhist/Humanist tradition, but since I’ve yet to find a preschool of that denomination, and since a nearby temple has an excellent program, Lilly goes to a Jewish preschool. As a result, this week in late March, on the tenth day of Lent, Lilly is celebrating Purim. When I woke up Friday morning I knew embarrassingly little about Purim other than that it is a very festive Jewish holiday that involves Halloween-type costumes and that Lilly had a Purim Parade and Celebration at school. Now having gone to that celebration I know a tiny bit more. I know it also involves a king and queen, a woman named Esther, a mean guy named Haman and treats called hamentaschen. And, just as happened with Hanukkah, this particularly fun week at school for Lilly ended with her walking out with the coveted “Shabbat Basket.” You may recall this basket from our Winter holiday drama, when my dinosaur-obsessed daughter was nearly lured away from the ubiquitous callings of commercial Christmas into the cute and fuzzy arms of a T Rex, who happens to enjoy celebrating Shabbat. Well, he’s ba-ack! Don’t get me wrong. I have absolutely no qualms with Lilly becoming fully acquainted with the Jewish faith. In fact, I like that she is becoming acquainted with a religion other than Christianity, which will no doubt be thoroughly jammed down her throat as she grows up in Kentucky. I wouldn’t even have a problem with her choosing Judaism as her one and only faith as she grows up. What I didn’t envision myself doing as a mother, however, was driving Lilly home from school listening to her new favorite CD “I’ve Got a Shabbat Feeling!” featuring such hits as “It’s Shabbat and I Feel Good!”, “Put A Chicken In a Pot” and “Twinkle Kochavim.” But I have no interest in discouraging Lilly away from religion (any religion), so I turned the volume up and drove along trying to come up with an alternative lunch for Lilly because ham and cheese suddenly seemed a bit inappropriate. We stopped and ate a kosher lunch, which Lilly enjoyed with her school-made Purim crown atop her head and the Shabbat T Rex in his own chair at the table. We went about the rest of our day with Lilly’s Shabbat T Rex curled in her arm and the occasional Purim song sung under her breath. And after a long day out of the house, Lilly suddenly became very animated recalling that there was some challah waiting for her at home in the Shabbat basket that we had dropped off earlier in the day. Alas, my ancestors had the last laugh. When we got home and I noticed Elliott’s car gone and our kleptomaniacal beagle grinning ear to ear I knew I was going to have an upset toddler on my hands. Not surprisingly, I soon found Lilly’s Shabbat basket overturned under the table, its contents emptied, and Lilly’s prized challah (and its plastic wrap) missing. Ten minutes of serious crying over canine-devoured challah later, I managed to appease Lilly with a Girl Scout cookie, dinner and then two more Girl Scout cookies. The rest of the evening went smoothly enough. It had been a long Shabbat, but it was bedtime at last. I’m not sure what the morning after Purim and Shabbat looks like in most Jewish homes. 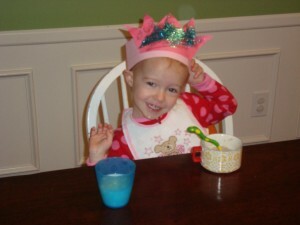 But in this home it has a very happy preschooler…wearing a Purim crown. The Shabbat Shalom by MushBrain, unless otherwise expressly stated, is licensed under a Creative Commons Attribution-NonCommercial-NoDerivs 3.0 Unported License. Terms and conditions beyond the scope of this license may be available at mushbrain.net.